Home News and Finance	The secret to being happy at 48? Bag Britain’s most eligible bachelor! Nine thirty in the morning, nearly six hours since her two alarms went off and Susanna Reid is powering through her lunch — a crayfish and avocado salad and chia pot, if you’re interested — and dissecting yet another blistering row with Piers Morgan, her co-host on Good Morning Britain. ‘He targets me personally as if I’m part of the radical feminist plot to destroy men,’ she says. The following morning, I watch from the studio wings as he taunts her for not being as good at Latin as him or knowing the ancient Greek alphabet. He interrupts and talks over her at every opportunity and then pretends to propose with Poundland’s new £1 engagement ring. But instead of losing her rag, or weeping, or smashing him in the face with her empty coffee cup (as many of us might have done had we been up since 3.50am and then had to wrestle with puffed up Piers), she just smiles, brighter and whiter and wider with each onslaught. Even so, it must take steely control — even she looked a bit shocked by the mock proposal — but she insists: ‘I’m not a violent person. No, no. I never lose it, ever’ she insists. Not at work, and certainly not at home in South London with her three sons aged 13, 14 and 16. Of course she doesn’t. She’s famously tough (‘I prefer strong to tough’ she says firmly.) Teflon-like, even. Nothing seems to gets her down or dent that grin. She has been trolled on social media (she has more than half a million Twitter followers); male viewers obsess constantly about her cleavage, her lovely slinky legs, her inky hair and pearly teeth. Entire online forums are dedicated to the several times she inadvertently flashed her (admittedly rather jauntily animal-printed) knickers. But she just brushes it off, grits her lovely teeth and smiles wider. Without her make-up she looks completely different, and in her off-duty choice of jeans and T-shirts, insists she is ‘very, very rarely even recognised’. She also has a sharp mind, a quick wit and, when she can get a word in, is adept at skewering even the nimblest of politicians. But for all her calming mantras, it must be galling working with Piers. As well as reportedly getting paid way more than her (understandably, she won’t reveal her salary, but he has joked about being paid £22.5 million), he saunters into work an hour after she does, grabs (and generates) most of the headlines and hogs at least 85 per cent of the unscripted air time. ‘It’s each to their own, whatever you can grab. Piers takes most of it so I have to make my point succinctly and powerfully,’ she says. Today she calls him ‘unhinged’ and ‘deranged’, and rolls her eyes a lot at the audience. When he deliberately mentions her new(ish) Alpha male, multimillionaire boyfriend, Steve Parish, even though he knows she’s desperate to keep the relationship under wraps, her grin becomes positively rictus. Of course she is. Parish, a 54-year old divorced father-of two and the owner of Crystal Palace Football Club is hot, hot, hot! And with a £45 million fortune, very eligible. His Instagram account charts a deeply enviable life of super luxe holidays, long al fresco lunches, wakeboarding and skiing. Parish himself boasts a deep, year-round tan, fantastically lustrous hair and a lean, brown, unnervingly gym-honed torso. (It was Piers who introduced them when they were all in New York during the U.S. elections in 2016 and, naturally, taunted her on air when news of their relationship broke last October — despite the fact Susanna had bought in a bottle of his favourite champagne to bribe him to keep schtum). Parish looks like the sort of divorcee who, second time around, tends to embrace a younger, lither second wife with no ties and a lot of time on her hands to loll about in string bikinis on yachts. So how refreshing that, instead, he has fallen, hard, for Susanna, a 48-year-old single mum who lives immersed in current affairs in a ‘very messy’ house. (‘I am “mess blind” — most of the time I don’t notice it and don’t feel the need to tidy up,’ she insists). On top of all that, four mornings a week, she has to get up in the middle of the night to go to work. She also, thanks to a very choppy childhood and serially divorcing parents, has never had any interest in getting married. Not to Dominic Cotton, her ex-partner of 16 years and father to her boys. Naturally, not to Piers, her on-screen ‘husband’. Not even to Parish, however rich and handsome he is. In fact, she says no one has ever proposed to her and she doesn’t want that to change, ever. I love to hate Piers and hate to love him. His wife and I treat him like a toddler we pass between us! Which, in their case, must involve a lot of skilful juggling, because it’s hard to see how even an exciting new globe-trotting lover can be rammed into a routine as brutal as hers. Bed by 9pm — not much scope for week-night romantic dinners — up at 3.50am and into the waiting car by 4am, either still in pyjamas, or whatever she took off the night before. She has never overslept. For ages — she’s been on breakfast television in one shape or form for more than 20 years — she relied on just one alarm, playing ‘Russian roulette with my eyelids’, until a shocked Richard Madeley told her he had alarms dotted all around his bedroom — ‘he even has one in the bath’ — and put the fear into her. Breakfast is a small pot of peanut butter, a sliced apple and a lot of coffee. Lunch, eaten between 9am and 9.30am and usually followed by a two-hour sleep with black-out blinds, is low carb and carefully monitored — not quite the sprawling, sociable al fresco lunch, sometimes mentioned by Parish on his social media. With Dominic living round the corner and sharing childcare, she insists it all works like clockwork and, after her nap, is all revved up to cook her sons a wholesome meaty dinner from scratch and enforce her strict ‘no phones at the table’ meal-time ban. Not that she eats with them. She’s a pescatarian and, since August, when her doctor declared her BMI worryingly high she has shed a stone and a half, mostly by giving up snacking and eating more healthily. The hardest thing was giving up booze. ‘I love it. I used to love drinking — nice white wine, bubbles, prosecco. I used to love doing vodka shots last thing at night in the Groucho. I love margaritas. The only thing I didn’t like was red wine.’ She used to enjoy going ‘wild’ in Ibiza with her friend Judge Rinder and has enjoyed a few 3am finishes with Piers, who is forever badgering her to come drinking. ‘He’s constantly, “Oh, you’re no fun. Why don’t you just have a glass of wine, no-one will know.” I miss it. I really do. Because drinking is fun and enjoyable and you can have some of your best nights out but, on the other hand, it adds the weight on,’ she says. So she hasn’t had a drink since August. It helps that Steve is teetotal, too, but I rather suspect that when Susanna decides to do something, that’s that. She was nine when her parents — her father was a management consultant; her mother a nurse — split, and she cried for weeks. Her elder brother went to live with their father, she stayed with their mother in south London. Both parents later remarried and subsequently divorced. Susanna, meanwhile, became ‘very aware and protesty’. She went on anti-apartheid marches, became a vegetarian and dabbled in acting — appearing in Channel 4’s The Price with Harriet Walter in 1985 — and journalism. She dreamt of becoming a war reporter like her heroine Kate Adie. She thrived at St Paul’s Girls’ Independent School with actress Emily Mortimer and journalist Sophie Raworth — and was the first female editor of the student newspaper at Bristol University, where she studied Politics, Philosophy and Law. ‘My motto was “no guts no glory”. I was ‘never afraid to try things I might fail at,’ she says. In her broadcasting career — 20 years at the BBC during which she presented BBC Breakfast with Bill Turnbull, and now four with ITV — colleagues and rivals have commented on her searing ambition and drive. In a particularly unsisterly attack, Fiona Fullerton, a fellow contestant on Strictly in 2013, denounced her ‘military-style’ publicity campaign and lack of charm. But today, Susanna insists she isn’t ambitious. ‘I wouldn’t even know what I’m going to do next week,’ she says. ‘I have absolutely no plan and have never had one and I don’t set goals’ she says. My eyes must pop a bit, because then she clarifies. So when she was working as a reporter at BBC News 24 and the presenter failed to show up one night, she stepped in, still wearing her coat and three months pregnant. Overnight she made the transition to presenter. She did the same in 2010 for Andrew Marr on the Sunday newspaper review when he was late interviewing new prime minister David Cameron. And when, in 2013, the BBC announced it was moving some productions to Salford, unlike several colleagues who resigned, and despite having three young boys, she embraced the commute. At the same time, she was offered a place on Strictly and was partnered with Kevin Clifton. She was expected to win, but came second to Abbey Clancy, and split from Dominic soon after. Within weeks, and after 20 years at the BBC, she moved to ITV to co-host the all-new Good Morning Britain with Ben Shephard. ‘The opportunity came up and I wasn’t going to turn it down,’ she said. 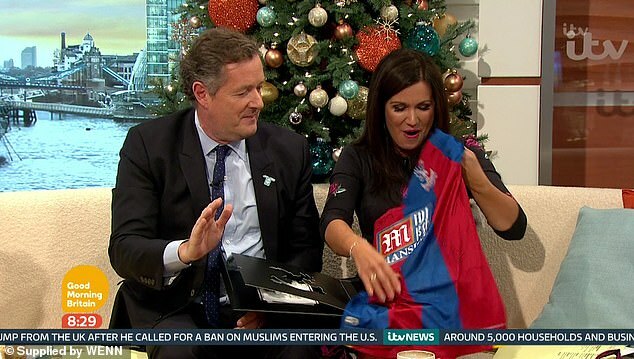 Another wobble must have come in 2015 when Piers was drafted in as her co-host. Anxiously asking bosses about her role alongside Piers, she was told they’d be like Coronation Street’s ever bickering couple, Jack and Vera Duckworth, constantly arguing, but loving each other deep down. It seems to be working. 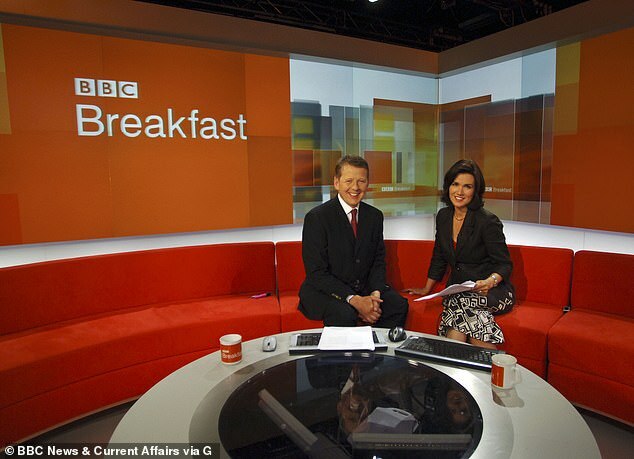 Both the viewing figures and audience share are up and, for the first time ever, Good Morning Britain was shortlisted for the National Television Awards this year. Despite the rabid on-screen animosity, she insists that off screen they are friends: ‘I love to hate him and hate to love him’ and that she and his wife Celia ‘treat him like a toddler we can pass between us’. Not many people could control Piers, far less want to. But today, as he rants and raves behind the Good Morning Britain desk and belittles her (considerable) intelligence, on and on she smiles. Perhaps underneath she’s secretly fuming — it’s impossible to tell. Or perhaps she’s just thrilled that, at 48, when most women are wrangling with hormonal changes and while Piers suffers every ‘itis’ under the sun, she is firing on all cylinders with a great job, three lovely boys, a hot new body and a very handsome and immensely rich new lover. Good Morning Britain weekdays on ITV, 6am to 8.30am.